Kick off your visit on the 31st (Mon): look for gifts at Alex's Fashion, stop by Scandi Fashion, and then stop by de' MARCO Fashions. Get ready for a full day of sightseeing on the next day: stop by Martin Collection, then stop by Ander's Collection, then stroll through Nopparat Thara Beach, and finally hike along Tab Kak Hang Nak Hill Nature Trail. Start your trip to Krabi Town by creating a personalized itinerary on Inspirock. Reykjavik, Iceland to Krabi Town is an approximately 22.5-hour combination of flight and bus. The time zone difference moving from Greenwich Mean Time (GMT) to Indochina Time (ICT) is 7 hours. Prepare for much hotter weather when traveling from Reykjavik in December: high temperatures in Krabi Town hover around 36°C and lows are around 26°C. Cap off your sightseeing on the 2nd (Wed) early enough to catch the ferry to Ko Phi Phi Don. Kick off your visit on the 3rd (Thu): enjoy the sand and surf at Laem Tong Bay, glide peacefully along the water with some of the best stand-up paddleboarding in the area, and then make a trip to Koh Phi Phi Viewpoint. For where to stay, ratings, and tourist information, you can read our Ko Phi Phi Don driving holiday planner . You can ride a ferry from Krabi Town to Ko Phi Phi Don in 1.5 hours. Alternatively, you can do a combination of bus and ferry. In January, plan for daily highs up to 37°C, and evening lows to 26°C. Wrap up your sightseeing on the 3rd (Thu) early enough to ride a ferry to Ko Lanta. 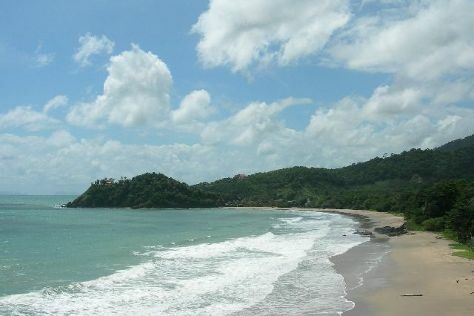 You'll enjoy a bit of beach vacationing at Khlong Dao Beach and Lanta Klong Nin Beach. Head to Lanta Art and Lanta Fashionfor plenty of shopping. Next up on the itinerary: tour the pleasant surroundings at Kantiang Bay, get a taste of the local shopping with ASALANTA, look for gifts at Fashion Point, and choose your vessel at Lanta Diver. To see photos, traveler tips, more things to do, and more tourist information, read our Ko Lanta trip itinerary planning app . You can ride a ferry from Ko Phi Phi Don to Ko Lanta in an hour. Expect a daytime high around 38°C in January, and nighttime lows around 26°C. Finish up your sightseeing early on the 6th (Sun) so you can travel back home.